Thanksgiving is a time of opening up our homes to friends, relatives, and loved ones. Below is a great guide in how to prepare for your Thanksgiving Eat-a-thon courtesy of Epicurious.com. Have a favorite recipe or must try dish, share it with us in the comments below! ¢ Move turkey stock from the freezer to the fridge to defrost overnight. ¢ Assemble and bake pies; store them at room temperature (unless they’re custard-based, such as pumpkin pie, which should be refrigerated). ¢ Cook soups, then cool and refrigerate. ¢ Prepare mashed or roasted root veggies such as sweet potatoes, turnips, rutabagas, parsnips, celery root, carrots, and beets, then refrigerate. If you have a microwave, you can add mashed potatoes to the list of vegetable sides that can be prepared in advance and reheated. If you don’t, plan on making your mashed potatoes on Thanksgiving Day, as they tend to get gluey when reheated on the stove. ¢ Prep any garnishes or toppings, such as toasted nuts or grated cheese, for the recipes you’ll make on Thursday. ¢ Clean and dry salad greens and store them in resealable plastic bags with a paper towel tucked inside. ¢ Check to make sure you have the following dinner party essentials: aluminum foil, containers for leftovers, paper towels, butter, ice, clean dish towels, dishwashing detergent, and a good soundtrack to cook to tomorrow. If you get all these tasks done, congratulations! You’ll be in very good shape for a stress-free Thanksgiving! The turkey will be the most time-consuming item, so getting it in the oven is the first thing you should do. ¢ If you premade bread or rolls and froze them, take them out of the freezer and leave them in their bag on the counter to defrost. ¢ Chill white wine and beer. Set up the bar for any other drinks you’re serving. 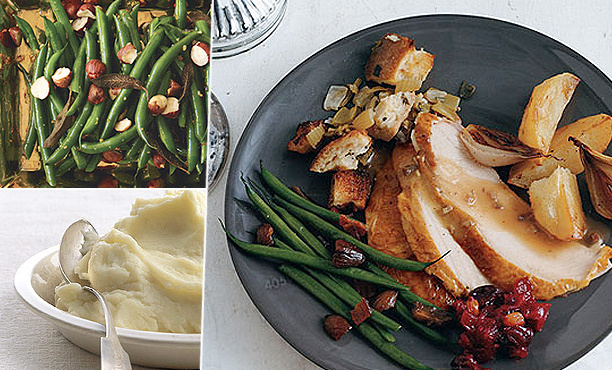 While the turkey is roasting, complete everything else on your menu that’s not already made. Keep items warm by covering with foil or, if they’re ready more than two hours ahead, refrigerate until it’s time to serve them and then briefly reheat. ¢ Prep ingredients for hors d’oeuvres such as toppings and toasts for bruschetta or cut-up veggies for dip. If perishable, refrigerate until ready to serve. ¢ Prep casseroles or baked items such as baked stuffing. If possible, bake them alongside the turkey during the last hour or two of roasting. Or, if necessary, pop them into the oven as soon as the turkey comes out. ¢ Prepare the mashed potatoes, unless you already did so yesterday. Keep warm in a pot on the stove. ¢ Prepare any items that are cooked on top of the stove, such as sautÃ©ed or steamed veggies. If possible, cook to slightly less than done, then cover and keep warm. ¢ Just before guests are due to arrive, assemble hors d’oeuvres and set them out. (If you haven’t already done so, designate someone to take guests’ coats and offer them drinks so you can finish cooking.) This is also a very good time to step back, enjoy a sip or two of wine, and admire your work. When the turkey comes out, transfer it to a platter and let it rest while you do the last-minute tasks. It has to rest at least half an hour for the juices to redistribute, and depending on size, it’ll stay warm for at least 45 minutes. If you need longer than that, tent the turkey loosely with foil to keep warm. ¢ Pop the rolls or bread into the oven (covered with foil) to heat slightly. Then transfer to a cloth-lined basket and cover with foil to keep warm. ¢ Make coffee or tea. ¢ Whip cream for pies. ¢ Pack up and refrigerate leftovers within two hours. If you have a lot, guests will love being sent home with extras. See our complete guide to Thanksgiving leftovers for storing and reheating guidelines. And don’t forget to save the turkey carcass to make stock or soup! The big feast is over. Congratulations! We hope everything went exactly as planned. After all your hard work, you might not want to do anything more complicated than microwave a plate of delicious turkey and stuffing. But if you’re looking for other creative ways to use up all the extra turkey, stuffing, gravy, potatoes, and cranberries, our ultimate guide to leftovers has you covered. We provide all the how-to essentials on storing and reheating your holiday favorites, plus tons of ideas for putting a fresh new spin on them. A turkey sandwich might satisfy for a meal or two, but after a couple of days, we predict you’ll be craving something different. Get ready for Turkey Chilaquiles, Porcini and Stuffing Strata, and Mashed Potato Pancakes. For even more suggestions, check out our recipe collection of 21 tasty ideas for leftover turkey. If you have houseguests, this post-holiday brunch menu would be a nice send-off”as a bonus, the recipes use up leftover turkey and canned pumpkin! For more easy morning meals, browse all our breakfast menus. If you’re heading out to start your holiday shopping today, this simple pizza dinner will definitely come in handy when you get back from a long day at the mall. 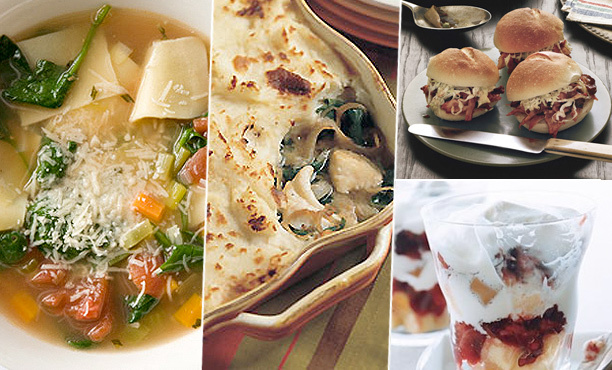 To find more effortless Friday night meal options, peruse all our quick and easy menus.